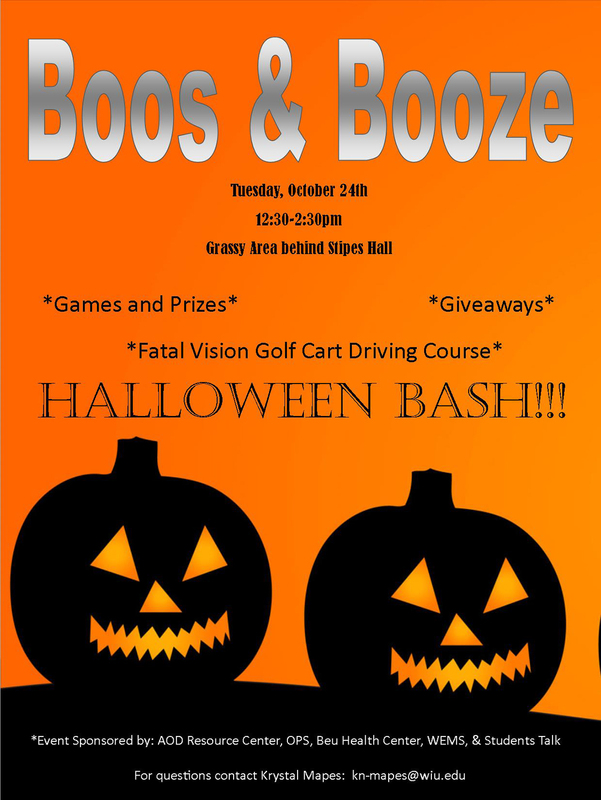 MACOMB, IL – The Alcohol and Other Drugs Resource Center at Western Illinois University will host Boos and "Booze" from 12:30-2:30 p.m. Tuesday, Oct. 24 in the grassy area behind Stipes Hall. 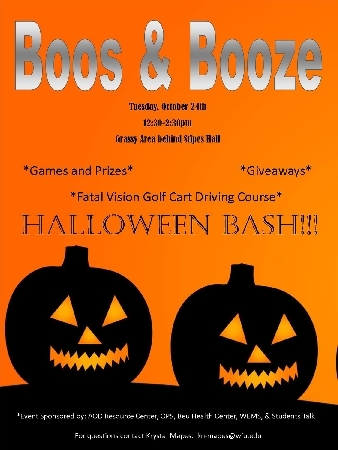 AOD Representatives will have games and prizes, giveaways and a Fatal Vision golf cart driving course to simulate the impact of drinking and driving. The event is planned to bring awareness about alcohol consumption, drinking and driving and risky sexual behaviors that occur around Halloween. It is sponsored by the AOD Resource Center, the WIU Office of Public Safety (OPS), Beu Health Center, Western Emergency Medical Services (WEMS) and the Students Talk organization. The AOD Resource Center provides a variety of campus services, including driving under the influence of alcohol (DUI) evaluations, DUI risk education, early intervention, alcohol and drug use assessments and level one outpatient treatment. They also provide educational services to University 100 classes, fraternities and sororities and other organizations on safe alcohol consumption. For more information about the event, email Krystal Mapes at KN-Mapes@wiu.edu.